Allows you to migrate data between various database formats in 3 steps without any scripting! It dramatically cuts the effort, cost, and risk of migrating to/from any of the following database formats: Oracle, MySQL, MariaDB, SQL Server, PostgreSQL, IBM DB2, IBM Informix, InterSystems Caché, Teradata, Visual Foxpro, SQLite, FireBird, InterBase, Microsoft Access, Microsoft Excel, Paradox, Lotus, dBase, CSV/Text and transfer any ODBC DSN data source to them. This software can help you quickly migrate a variety of data, structures and objects, saving you a lot of time and money. 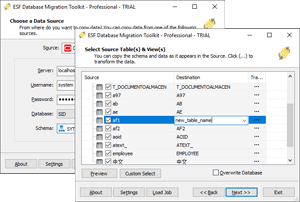 It will automatically migrate all table structures, data, schemas(Oracle, SQL Server 2000 or higher, PostgreSQL, IBM DB2 and so), LOBs(Large Text/Binary Objects), primary/foreign keys, indexes, auto-increment(serial), comments and default values and more. This software uses the latest and most advanced migration technology for systems with a variety of data volumes. It features DBMS Native API and bulk-insert technology that can enhance productivity by speeding up the entire migration process. Our customers success by using this tool to migrate Carrier-Grade database with multi-million records (SQL Server to Oracle)!